Budgies (budgerigars), also known as parakeets, are native to Australia and among the smallest parrots in the world. In the wild, budgies are green and yellow, but selective breeding in captivity has created color combinations of yellow, blue, grey and white. Budgies are a popular pet because they're social, playful, lively and easy to tame. Male budgies are considered one of the best talkers available for bird owners, according to author Diane Grindol on BirdChannel.com. Entertaining your budgie might be a challenge at times, but it's vital for keeping him content. 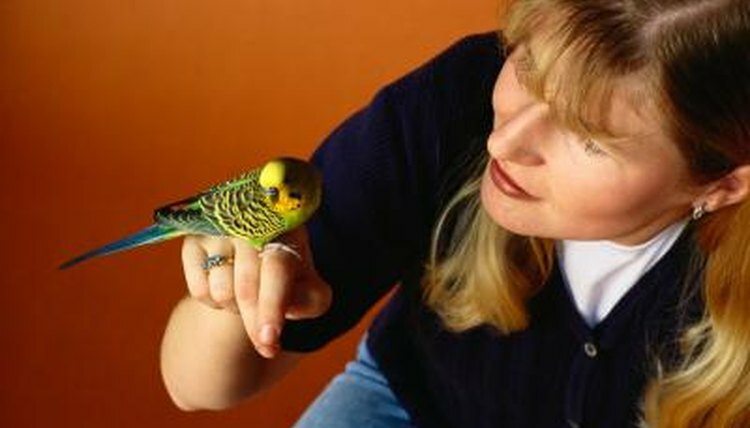 Budgies are social creatures and require daily interaction with humans. You can keep your budgie entertained and connected to you, even while engaging in activities around your home. Move his cage to the room you're in and talk to him -- explain what you're doing, such as preparing dinner or doing laundry. Keep his cage near you while watching TV, or perch him on your shoulder and offer a running commentary about the show. Play interactive games with him as often as possible. For example, hold a small mirror a few inches in front of your budgie until he runs toward his reflection. As he moves closer, move the mirror in different directions so the bird chases it. Reward him during the games with treats. Change your budgie's toys and environment at least every two weeks. His toys should vary in function, color and texture. Budgies are entertained by swing toys, mirrors, bird-shaped toys, Olympic rings, ladders and toys with bells. If you can't afford to buy new toys, change the location of the toys in his cage. Avoid leaving the cage in the same location -- move it to different areas of your home to vary the levels of noise and activity around him, and keep his environment interesting to him. Ensure the toys are thoroughly cleaned when you disinfect and clean the budgie's cage. When your budgie finds himself alone, he can become bored and lonely or have trouble coping during your absence. Keep your budgie entertained while you're away by leaving a TV or radio on, which will provide comfort, keep him company and teach new words while provoking him to talk back, says Grindol. To keep your budgie visually entertained, place the cage on a windowsill so he can watch cars, people and wildlife. Hang a bird feeder outside the window for additional entertainment. However, avoid placing the cage in direct sunlight. If you're unable to spend enough time with your budgie, get him a bird buddy to offer companionship and help keep him entertained. If you own a male budgie, it's best to select another male for the most harmonious relationship. Female budgies tend to dominate social interactions, which can lead to squabbles. If you buy a female budgie as a companion for a male, keep the two birds in a cage large enough that the male can escape if the female rejects his courtship advances and becomes angry. Avoid keeping two female budgies together -- they're apt to become territorial, and fight and squawk over space.